A very canny marketing company in Toronto who know I have roots in South Africa have sent me two bottles of wine from the Stellenbosch wine region: Two Oceans Shiraz and Flat Roof Manor Merlot and a very complicated recipe for Sosaties, a typical South African barbecue dish of marinated lamb, onion and apricot with a touch of curry and is grilled on skewers. During our two week visit to South Africa in 2004, We ate all kinds of interesting meat but I don’t remember lamb being one of them. Ostrich, goat, crocodile, water buffalo, wildebeest, and deer variations like kudu, blesbok and springbok as well as numerous fish I’d never heard of. Most memorable was Biltong a kind of meat jerky made of any of the above meats and eaten cold, sliced on salad, chopped into stews etc. Stellenbosch is a leading wine area of South Africa. It was founded by Simon van der Stel ,the first governor of the southern African territory governed by the Dutch East India company. He is largely credited with starting the South African wine industry. Van der Stel was the son of a Dutch East India Company official Adriaan van der Stel and Maria Levens the child of a freed Indian slave ,making him “Eurasian” and not white, a fact the Afrikaans refused to acknowledge during the apartheid era. There are no true portraits of Simon van der Stel in existence. 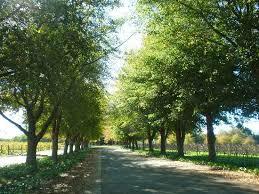 We toured Stellenbosch, a lovely town with oak trees lining the streets. Van de Stel had them planted there so that they could be used to make wine barrels but unfortunately the wood grain in their climate is too porous for wine storage. These days, they generally bring in American oak barrels. The 2011 Merlot they sent me is described as having a flavour bursting with raspberries and spices with a lingering aftertaste. It is said to age well and is excellent for wintery evenings spent around a fire. Which might be why it was recommended for Canada’s Braai Day as we’ve had more than a few chilly evenings recently. The second red they sent was Two Oceans Shiraz. 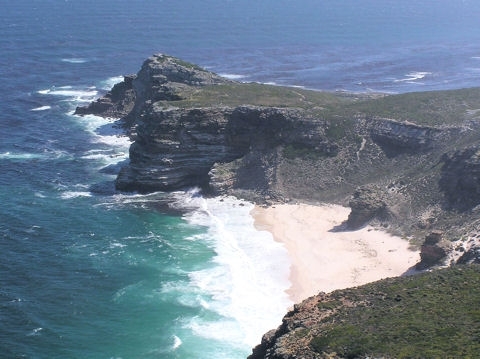 For anyone whose ever climbed the Cape of Good Hope, the two oceans are an unforgettable sight. On one side of the Cape is the Atlantic with cold currents coming off the coasts of the Antarctic and on the other side is the southern reaches of the Indian Ocean with Agulhas current coming from the tropics. The tumultuous meeting of these two oceans shape the unique climate of South African terroir. All Two Oceans wines are produced with eco-sustainable principles and carry the sustainability seal guaranteeing production integrity. They are also supporters of the South African Sustainable Seafood Initiative to improve the conservation of over-exploited fish stocks. Two Oceans wines include Pinot Gris, Shiraz Rosé, Pinot Noir, Shiraz and a Cabernet Sauvignon Merlot blend. The tasting notes for my bottle of Shiraz describe it as dark red with purple edges, with flavours of vibrant cherry and plum with a smoky note, and a sprinkling of pepper. Ideally served with grilled meats and pasta dishes. It took 24 hours of prep with overnight marinating, blanching and refreshing onions and then soaking dried apricots in the onion water and several other steps. Threading everything on skewers resulted in some nasty jabs and coupled with an electrical problem with the barbecue, my husband and chef was not in the pleasantest frame of mind. “Never again!” was muttered repeatedly amidst a string of invectives for the last hour of cooking, and then it was done. 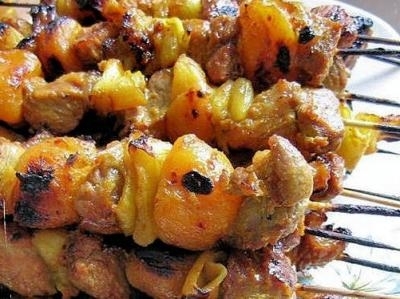 Rice, sosaties skewers of barbecued lamb, peppers, onions and apricots paired with Flat Roof Manor Merlot. 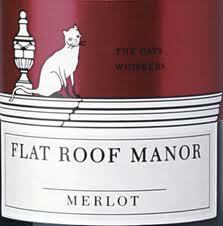 The wine tasted more of blackberry than raspberry, had smoky overtones and a touch of spice. and paired beautifully with the fruit flavoured mildly curried lamb and apricots. An added plus, the Merlot did not go to my cheeks which is why I rarely drink red, but it was dangerously more-ish. Colin slipped the recipe into his favourites folder and is already talking about what he’d do better next time. We’ll try the Two Oceans Shiraz with barbecued pork on the weekend. Any day is a good day for Braai. We tried the Two Oceans Shiraz with Barbecued Pork Loin. Delish!